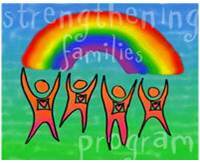 Strengthening Families Meath, is a 14 session family skills training programme designed to increase resilience and reduce the risk factors for 12-16 year old children and their parents. Each session begins with a meal where families have the opportunity to sit down together before starting their sessions. How will it help me and my family? Parents learn to increase desired behaviours in children by using attention and rewards, clear communication, effective discipline, substance use education, problem solving, and limit setting. Children learn effective communication, understanding feelings, coping with criticism, stress management, social skills, problem solving, resisting peer pressure, consequences of substance use and compliance with parental rules. Families practice structured family activities, family meetings, communication skills, effective discipline, reinforcing positive behaviours in each other, and jointly planning family activities. How can my family register this programme? The SPF programme is supported by a number community organisations and family support agencies. Families are referred on to the programme through a number of these support services.